Recently, a friend of mine rode one of the latest “longer travel” trail bikes (around 160 mm of rear wheel travel) and was blown away by the bikes capabilities on the trail. He couldn’t come up with a reason why he shouldn’t have one and he asked me what I thought. I told him that I may not be the best guy to talk to when trying to make the decision on whether or not to buy a new bike – of course you need one of those! Who doesn’t! But he asked me another very interesting question about having a “bigger” (more travel, slacker angles, heavier – more “all-mountain” or “enduro”) bike versus a “smaller” (lighter, less travel, steeper angles – more XC race oriented) bike, and which would be the best bike for skills progression. I think that most riders believe that the smaller bike would be. Most riders believe that it would require more skill to ride: it would force better( or, at least more precise) line choices, near perfect riding position, etc, and therefore, make a rider learn proper technique. While with the big bike, one could simply plow into obstacles, and the bike would do all the work – no skill required! But I actually feel that the opposite is true: the bigger bike is more likely to give the rider opportunity to learn the skills and get the tools necessary to develope proper technique while the smaller bike may actually inhibit the learning process. First, we don’t learn very well when we’re scared or in “survival mode”. 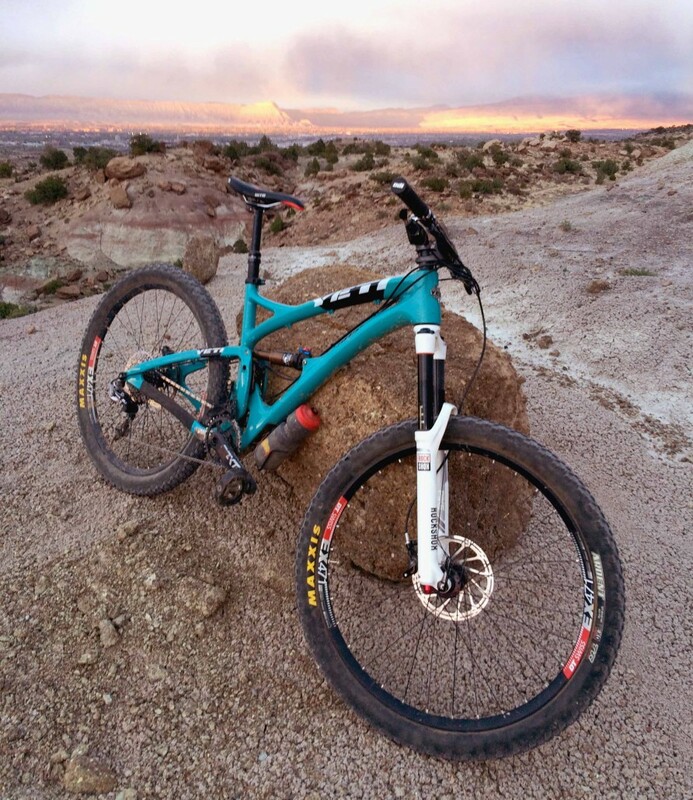 With many mountain bikes that are very much on the XC racing side of the spectrum, the combination of things like tire choice, stem length, the geometry of the frame, the rigidity and strength of the parts (or lack thereof) – especially having the seat jacked up to the climbing height while descending (no adjustable height seat post) – can all add up to a pretty dicey ride when trying to negotiate difficult terrain. Will the thing climb like a rocket ship? Yep, probably will. But as soon as these bikes get pointed downhill or into tough terrain, a lot of riders end up in the “just-try-not-to-crash-mode”. And this is obviously not a very good environment for learning and applying new techniques. On the other hand, the bigger bike will instill confidence. The rider will now have a controlled setting of sorts, and have the ability to focus on specific aspects of riding instead of simply “just-trying-not-to-crash”. More importantly, the larger bike allows for higher speeds in the tough sections, thus, allowing the rider the opportunity to process the trail at these higher speeds and get accustomed to them. This is huge. Anyone who has ever taken my instruction comes away with a new understanding and respect for how important trail-vision is on the bicycle. We spend a lot of time on vision, breaking down the techniques for using vision on the bike, how, and why they are necessary. I often stress that if you can only learn one chunk of the instruction, make it vision because it is the most important thing when riding the bike. Of our five senses, vision is giving us nearly all of the information we need pertaining to what is happening in the immediate future with our ride. If I am scared, it is because I see obstacles that seem intimidating or maybe because I’m going – what I perceive to be – too fast. The way we see the trail and its perceived dangers affects us psychologically and this determines the decisions that we will make. Again, a bigger bike gives you the opportunity to learn how to see and process the trail at higher speeds. You become comfortable at these speeds and therefore confident. Now you are able to work on techniques and learn skills and apply them at speeds and in terrain that would be very difficult to do with a smaller bike. Yes, you will eventually find your limits on the bigger bike. And, yes, you do have to pedal the thing to the top (usually). But now, even if you do go back to that svelte XC race machine after being on the big dog, you have the ability to process at those higher speeds. Speeds that used to be intimidating, no longer are. Of course you will have to slow down for stuff on the small bike that you didn’t have to slow down for on the big bike, but now those decisions are more academic and not driven by fear and intimidation. Speeds on my XC/trail bike don’t seem fast because I’m used to the speeds of a downhill bike. Obstacles on an XC trail aren’t intimidating because I’m used to the obstacles on DH track. Of course I do need to slow down on the little bike for the same obstacles that I could blast through on the big bike, but it’s because I know that I don’t have the right tool for that particular job/section of trail—not because I don’t have the riding skills. Most of us have probably heard the story of someone’s buddy, who is a dirt bike rider and went on a MTB ride for the first time in his life, and was extremely fast on the descents – right away! Well, this person is used to processing the trail at dirt bike speeds (that are usually much greater then MTB speeds). He’s not intimidated, he’s seeing good lines; he’s doing this part of riding – arguably, the most important part – very well. The above is also a big reason why many pro downhillers ride a lot of motocross in the off-season. And, if we put an average DH racer on an XC bike and point her downhill, she’ll ride the wheels off the thing, only slowing because of the perceived limitations that the bike imposes on her – but not because of perceived limitations of her skill! So, if you were on the fence about getting into a longer travel trail machine, jump off and grab that credit card! Not only will you have a blast, but also you’ll own a great new tool for developing skills that will transfer over to you XC race bike very nicely! Took your advice and pounced on a 27.5+ 6″ travel bike. (Yes, I specifically told my wife “But Andy said to get one!”). While I was waiting on it to come in, I pulled the dropper/stem/handlebars off my old bike to put onto the new one. I put on the original non-dropper seat, a set of 650mm bars, and a 120mm inverted stem… basically the “OLD” setup I had before I took your class. Some observations I had: The seat was completely in my way and I had to stay seated the whole time. Cornering was a “lean your body, stick a knee out” type of affair. My arms and elbows were locked into position, and it was almost impossible to get the weight off my hands. On top of being too heavy on the front, the angle of my position had me basically staring at my front wheel the whole time. It was a history lesson of being sketchy, slow, and having a complete lack of confidence in how to handle a bike. I am now on the 6″ travel bike, 785mm bars, 40mm stem, with the dropper. It is game changing to say the least: the seat is out of the way, I can lean the bike, my weight is driving through my bottom bracket, and my head is up and looking way down the trail. I agree with you that it is more important to be on a bike that allows you to use your skills to their full potential, rather than be on a bike that will hinder your skills and reinforce bad habits. Good stuff, Jason… Thanks for the comment. Once you understand how the bike is actually supposed to be ridden, how it’s designed to be ridden..and how your body has to work in an athletic manner in order to do this… then bike set up starts to get real important and make a ton of sense.